The privately built SpaceX Dragon cargo capsule is moved into its final position on the International Space Station's Harmony module with a bright Earth in the background in this view captured during the capsule's March 3, 2013, docking. The Dragon capsule is delivery cargo to the space station for NASA. An unmanned commercial space capsule packed with precious cargo successfully linked up with the International Space Station early Sunday (March 3), making a flawless orbital delivery after overcoming a thruster glitch that delayed its arrival by a day. The SpaceX-built Dragon cargo capsule docked with the space station at 8:56 a.m. EST (1356) as the two spacecraft soared 253 miles (407 kilometers) over the Arabian Sea. NASA flight controllers performed the orbital link-up remotely by commanding the space station's Canadian-built robotic arm, which had latched onto Dragon three hours earlier, to attach the capsule to an available docking port. 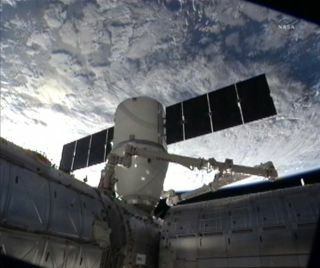 Dragon reached the space station at 5:31 a.m. EST (1031 GMT), a full hour ahead of schedule. Two NASA astronauts, station commander Kevin Ford and flight engineer Thomas Marshburn, used the station's arm to grapple the capsule as it approached close to the orbiting lab. SpaceX (short for Space Exploration Technologies) launched the Dragon capsule toward the space station on Friday (March 1), with the spacecraft riding the company's Falcon 9 rocket into orbit. While the launch was smooth, the Dragon capsule ran into trouble after it separated from the Falcon 9 rocket when three of four thruster pods did not activate as planned. After several hours of troubleshooting, SpaceX engineers isolated the glitch to a pressurization problem in the thruster system and devised a fix that solved the problem. Because of the time needed for the fix, the Dragon capsule missed its initial rendezvous slated for Saturday (March 2). The spacecraft's arrival on Sunday, however, went extremely smoothly. About four hours after the capsule was berthed to space station, astronauts opened the hatches between the two spacecraft to enter the Dragon, NASA officials said. "Happy Berth Day, Dragon," SpaceX officials wrote in a Twitter post. The same message was emblazoned on the company's website. "In solving the issues facing Dragon post-insertion, the team at SpaceX exhibited the ingenious engineering tenacity that has become a NASA hallmark, and further demonstrated the industry's readiness to perform the critical task of cargo delivery to low Earth orbit," Michael Lopez-Alegria, a former NASA astronaut and station commander who is now president of the Commercial Spaceflight Federation, said in a statement. "Congratulations to SpaceX and NASA for the successful berthing of Dragon this morning; I look forward to seeing Dragon back on Earth." This is SpaceX's third flight to the space station and second official cargo delivery under a $1.6 billion deal with NASA for resupply flights. Under that contract, the company has agreed to provide at least 12 Dragon supply flights to the space station. The Hawthorne, Calif.-based firm was founded in 2002 by billionaire entrepreneur Elon Musk to develop commerical rockets and spacecraft. "I remember exactly where I was the very first time I ever heard of this scheme …when I was a young astronaut, and I said, 'We're going to do what?'" Ford told Mission Control during the docking operation. "That was when it was an idea and now it is starting to become routine. " This NASA graphic shows the location of SpaceX's Dragon space capsule after its docking with the International Space Station on March 3, 2013. The Dragon capsule is delivering cargo for NASA under the CRS-2 (SpaceX 2) mission. SpaceX is one of four companies developing manned spacecraft under NASA's commercial crew program. Its manned spacecraft is an enhanced version of the Dragon spacecraft designed to fly seven people to the station and return them to Earth at mission's end. The Dragon space capsule that arrived at the space station Sunday will stay linked to the space station until March 25, when it will be plucked free using the robotic arm and released back into space. "What a fantastic day," Ford radioed Mission Control of the smooth Dragon rendezvous Sunday. "Obviously the vehicle is beautiful, the station is beautiful, the Canadarm2 is beautiful … the prettiest thing of all was the dance." This story, originally published at 9:20 a.m. ET, was updated at 2:46 p.m. ET to include new details about the station crew's ingress into the Dragon spacecraft. SPACE.com Staff Writer Miriam Kramer contributed to this report. You can follow SPACE.com Managing Editor Tariq Malik on Twitter @tariqjmalik. Follow SPACE.com on Twitter @Spacedotcom. We're also on Facebook & Google+. This article was first published on SPACE.com.